AIRPURA WHY AIRPURA AIR PURIFIERS? AirPura - All New Air Purifiers with AirPura Design Improvements You've Been Looking and Asking For. AirPura - the Powerful, Efficient, Quiet and Cleanest Air Purifiers Available. AirPura Air Purifiers Available in Wide Range of Models for Most Specific Air Cleaning Requirements. AirPura 10-Year Manufacturer's Warranty - Strongest in the Air Purifier Industry. AirPura Air Purifiers Available in Wide Range of Colors to Match Your Decor. AirPura - All New Air Purifiers with AirPura Design Improvements You're Been Looking and Asking For. Unobstructed Air Flow moves freely through the filters without changing direction and without creating any turbulence. This simplified, direct air flow improves overall air purifier performance and reduces noise. Large Capacity Carbon Canister features 18 to 26 lbs. of Regular or Enhanced Activated Carbon Adsorbent with 2" or extra deep 3" carbon bed for premium adsorption of over 4000 regular chemicals, specific chemicals, VOCs and tobacco smoke. Refillable Carbon canister helps save on the cost of replacements. Large Separate True HEPA Filter traps over 99.97 % of all allergens and dust down to 0.3 micron in size. HEPA filter Contains 40 to 100 sq. ft. of Hospital Grade HEPA filter media. The Warm rolled filter making process used eliminates cracking and tearing of HEPA media and guarantees higher filtration efficiency. Oversized Pre-Filter traps large dust and dirt particles, tar in tobacco smoke (T600 model). It also protects fine true HEPA filter from contamination and extends it's lifetime. Pre-filter can be easily vacuumed from the exterior through the metal mesh. Pressure Seal Filter Gaskets. Non off-gassing top and bottom felt gaskets seal the filter chamber. This eliminates polluted air bypass and improves the overall air purifier performance. One Piece Motor/Fan Assembly eliminates vibration associated with traditional design where fan is attached to the motor shaft with a set screw. Compact Motor/Fan design allows more room for placement of larger filters. Motor and Electric Parts in a Separate Chamber. Placement of the Motor and Electric parts in a separate chamber away from clean air flow prevents recontamination of filtered air by possible off-gassing from hot motor windings and electric components. Germicidal UV Bulb (AirPura UV600, AirPura P600) strategically placed in the center of the filter compartment sterilizes the filtered air from all airborne pathogens and kills microorganisms trapped in the filters at the same time. TitanClean™ Titanium Dioxide Photo-Catalytic Oxidizer (AirPura P600) Titanium Dioxide Photo-Catalytic Oxidizer dramatically increases the range of dangerous airborne chemicals that can be neutralized safely and effectively. In conjunction with the UV light, titanium dioxide (TiO2) coating creates an oxidizing process that instantly breaks molecular bonds and reduces airborne chemicals to smaller safer compounds, until only carbon dioxide and water vapor are left. AirPura Air Purifiers employ High Efficiency 5-Stage Air Filtration system to ensure the best air purification performance in combined dust, smoke, odors and most gaseous chemicals removal. AirPura - The Most Powerful Air Purifiers. AirPura Air Purifiers employ Powerful energy efficient motor rated at 560 CFM (cubic feet per minute) on High speed. The One-piece integrated Motor/Fan assembly is a PCS (permanent split capacitor) backward curved motorized impeller. It delivers the powerful and turbulence-free air flow that is the highest among most portable air purifiers on the market and sufficient for cleaning areas up to 2000 sq. ft. Variable Speed control allows you to choose between the Whisper Quiet operation (28.1 dB) on Low and Premium Full Power air filtration on High with countless number of settings in between. AirPura - The Most Efficient Air Purifiers. Large Hospital Grade True HEPA Filter is over 99.97% efficient in trapping of all microscopic dust and allergens down to 0.3 micron in size. Warm rolled HEPA filter media (to prevent cracking) features 10 pleats per inch (instead of 8 pleats in most other air purifiers) for increased air filtration efficiency and capacity. Large amount of HEPA filter media (up to 100 sq. ft. in H600 and I600 models) ensures unsurpassed filtration efficiency and filtration capacity among most air purifiers. Large Separate Carbon Filter Canister features 18 to 26 lbs. of Regular or Enhanced Activated Carbon Adsorbent. The Extra Deep 3" carbon bed (C600 and T600 models) renders the premium adsorption capacity for over 4000 regular chemicals, specific chemicals, VOCs and tobacco smoke. Wide variety of Blends are available to meet your Specific Air Purification requirements. Germicidal UV Bulb (UV600 and I600 models) produces the UV light with the wavelength of 253.7 Nm (nanometer). The UV light with this wavelength has an extremely strong sterilization power that is 1,600 times of a daylight and is very lethal to airborne pathogens - microbes, bacteria, germs, viruses. The UV Bulb placed in the core of the filter chamber provides guaranteed exposure to sterilizing UV light of all pathogens in the air and microorganisms trapped in the filters. Two MicroSupress anti microbial filters inhibit growth of odors causing bacteria and trap dust that may be released by granular carbon filter. Unique AirPura Vacuum Seal System with Top and Bottom Felt Gaskets eliminates any possibility for polluted air to bypass the filters and improves overall air purifier performance. AirPura - The Quietest Air Purifiers. One-Piece Motor/Fan assembly eliminates vibration associated with traditional design where fan is attached to the motor shaft with a set screw, and reduces noise. Unimpeded Air Flow moves directly from filters to the clean air outlet with minimal turbulence and noise. On Low speed the unit whispers at a mere 28.1 dB (6 ft. from the unit). AirPura - The Cleanest Air Purifiers. All components used in AirPura air purifiers are carefully selected to eliminate the possibility of toxic off-gassing from the unit and provide the maximum relief to people with Hyper or Multiple Chemical Sensitivity. The all metal housing with baked-on powder coat and the metal structure of carbon canister produce no toxic off-gassing. Top and Bottom Felt Gaskets produce no toxic off-gassing, unlike the rubber gaskets in most other air purifiers. Unlike in most other air purifiers, the electric motor and all electric components are isolated from clean air in a separate chamber. This prevents recontamination of filtered air by possible off-gassing from hot motor windings and electric components. Clean Air Outlet is in the upper desk of the unit, away from dust and dirt on the floor. AirPura Air Purifiers are available in Wide Range of Models for Residential, Institutional, Commercial and Industrial Applications. The wide variety of air filtration materials and additives used allow for high level of customization to meet the most Specific Air Cleaning requirements and Air Purifier needs. AirPura R600 is the Excellent choice for complete removal from the air of your home and office of all allergens, airborne contaminates, over 4000 chemicals, light VOCs and all noxious odors. AirPura V600 combines the efficiency of True HEPA filter in trapping of allergens and dust with the ability of Enhanced Carbon Mix to remove Formaldehyde, Ammonia, Aldehyde, other VOCs in High Concentrations. AirPura P600 incorporates the latest discoveries in Nano-Technology, developed by Space research laboratories to offer the Most Effective and Speedy airborne chemical, odor and VOC abatement available today along with the effective particle filtration and microorganisms supression. AirPura UV600 adds the extremely high Sterilization Power of UV (Ultra Violet) Light for airborne pathogens: microbes, viruses, bacteria, germs. AirPura C600 employs the oversized activated carbon canisters (26 lbs.) with extra deep 3" carbon bed to increase the dwell time for polluted air and thus to maximize the adsorption efficiency and capacity for over 4000 regular and most specific chemicals. 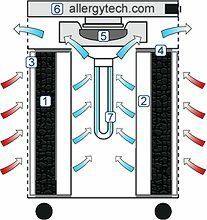 AirPura T600 employs a combination of a unique Tar trapping Prefilter, Extra deep 3" Carbon Bed Canister and HEPA filter for effective cleaning the air from Tobacco smoke, odors, particles and tar. AirPura H600 employs the oversized (100 sq. ft.) Hospital Grade true HEPA filter for large scale particle filtration. Best choice for allergy and asthma sufferers. AirPura I600 combines the air filtration efficiency of Hospital Grade true HEPA and activated carbon filters with the sterilization power of Germicidal UV bulb for pathogens and antigens removal. Best choice for HealthCare applications. Negative air accessories available to allow rapid set-up of isolations areas. Commercial Applications: Conference Rooms, Hotel Suites, Bars, Restaurants, Retail Outlets, Libraries, Museums, Art Studios, Indoor Recreation, etc. Medical Applications: Hospitals, Clinics, Laboratories, Dental surgery, Lasik Surgery, Isolation Wards, etc. Schools/Daycare Applications: Classrooms, Daycare Centers, Locker-rooms, Gymnasiums, Libraries, etc. Industrial Applications: Plant Protection, Clean Office Air, Welding/Soldering, Restoration, Plastic Molding, Laser Engraving, etc. In the unlikely event that you're not completely satisfied with your new AirPura Air Purifier, we provide a 30-day money-back guarantee (some conditions apply. See Customer Service page for details). 5-Year Warranty, Parts and Labor. AirPura Air Purifiers are warranted to be free from defects in material and workmanship under normal residential use for Five Years from the date of purchase. 10 Year Warranty, Labor Only. AirPura Air Purifiers are warranted to be free from defects in materials under normal residential use for Ten Years from the date of purchase. AirPura Air Purifiers are available in a choice of three attractive colors: Sandstone, White, Black to harmonize with the Decor of any home or office. The Range of colors includes: White, Black, Sandstone.